What are 5 steps to maximize the impact of CTE Funding? Last week, we released our new career and technical education (CTE) playbook, Funding for Value: Maximizing the Impact of CTE Funding. In today’s post, playbook co-author Matthew Joseph explores the five steps states can take to maximize the impact of CTE funding. Enjoy! Each state takes a unique, and often complex, approach to funding education, and these variations are often compounded with career and techncial education (CTE) funding. 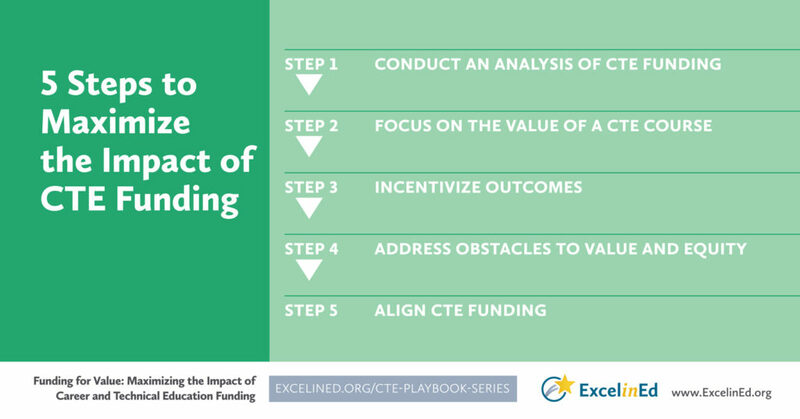 ExcelinEd’s newest CTE playbook, Funding for Value: Maximizing the Impact of CTE Funding, can help states identify ways to align their federal, state and local resources to maximize the return on investment of critical resources. Funding for Value suggests five steps state policymakers can consider as they design CTE funding structures to support high-quality, high-performance and high-value CTE programs of study. For more on each step, see the playbook. To calculate a return on investment and avoid duplications and inconsistencies, a state must first understand its investment in CTE. Policymakers should consider reviewing state funding allocations, expenditures of state CTE funds and the local investment each of their districts makes in CTE. Effective approaches to CTE funding consider the value of CTE courses and programs in terms of future career opportunities, advancement and earning potential. States should consider exploring ways to link a portion of funding to actual student performance. Incentivizing improved student outcomes rewards schools and districts for implementing high-quality, effective programs. As states focus funding on CTE courses that provide the highest value to students, they can also use funding to address—and phase out—lower-value courses. Once a state has a clear vision about how it wants to invest in and incentivize CTE, it can align and braid its funding. Aligning means that if the state has identified high-value programs of study, the majority of state funding supports those priority programs. Braiding indicates that the various streams of funding complement each other.